Cottage style 'Gíte' and garden appartment, each for 1-4 persons. 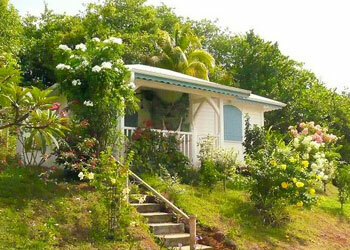 Air conditioned, WiFi, swimming pool, private parking, secluded beach. From €350 per week. Awake, open the door to the sound of waves, bird song in a tropical garden and a glorious sunrise. 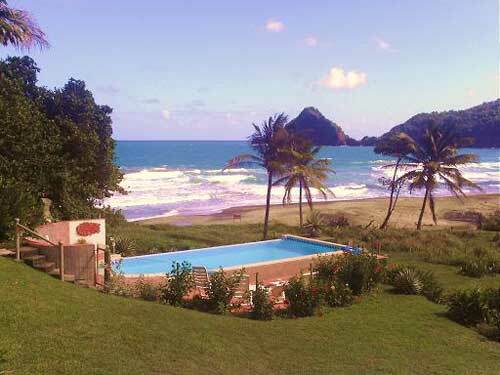 An exceptional site, 50m from a stretch of sandy beach, where the small Charpentier River enters the sea. Peaceful and private, benefiting from the sea breeze, temperatures rarely rise above 32ºC (90ºF). The property extends into the verdant and exotic coastal forest. From your hammock on the verandah or while relaxing by the pool, you can watch the surfers riding the waves. At dusk you will see hundreds of white egrets come to roost in the trees along the river, and as darkness falls, the fire flies appear... Paradise indeed. 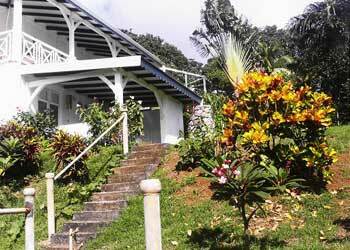 2 km from the village of Le Marigot, 15 km from La Trinite town, and 40 km from the airport at Lamontin, and the capital, Fort de France. 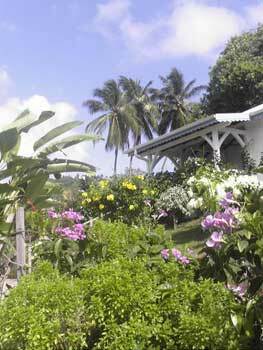 The luxuriant tropical forest of flowers, tree-ferns, and hanging vines. Many streams and waterfalls, with walks and hiking trails. 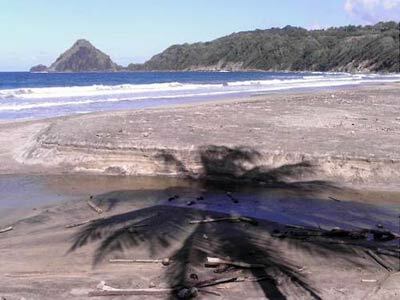 The area produces bananas, pineapples and other tropical fruits. Buy freshly caught fish directly from the boats or catch your own! Local street markets daily, visit the Museum of Rum and the Plantation Train, the Museum of Bananas, Botanical Gardens, and ascend Mount Pele to view the whole island. Visit local craft centers, making hats and baskets, ceramics and the traditional madras costumes. Diving, sailing and boat hire available nearby. Fort de France has a fascinating archeological museum, and large markets. Wide range of restaurants in vicinity. Here in the North of the island the people are friendly, smiling, helpful and cheerful. You will be hard put to find their like elsewhere in the Caribbean.